I made my way to the Fletcher Free Library for some Saturday board games for the first time in quite a while. As the weather in Vermont becomes more clement, I and many other sensible people want to spend less time indoors, particularly on sunny afternoons. However, we’ve been going through a bout of heat and humidity lately, so I thought the air-conditioned library would be a good place to hide out for an afternoon. As it turns out, the room reserved that day for board games has a skylight, which is not conducive to staying cool on warm days. Still, we did get some games in before the heat and stuffiness drove us out. When I got there, Andrew and his friend were checking out the library’s graphic novel collection. I think I witnessed someone’s first time reading Neil Gaiman’s The Sandman, which was a funny thing to realize. Once Sarah and Alex came along, we played a couple rounds of Dominion; the first round, we randomly mixed cards from Intrigue with Seaside, which was fun, albeit unmemorable. I can’t remember coming up with or observing any really dynamite combinations. The second game sticks out in my memory much more clearly. It was straight-up Intrigue — still maximizing my purchase, y’see — and we played the Victory Dance setup, which includes the Saboteur. Now, I’d dealt with the Saboteur before last week at Quarterstaff, but it didn’t do a whole lot. This time, however, it got my damn Province, which was heart-breaking and irritating all at once. If I play that setup again, I’ll try spreading out my victory points more by going for Duchies and Dukes. I opted to stay out of the struggle, thinking that everyone else would descend upon them and I could snaffle up Provinces like usual. And by the way, Upgrading Estates into Great Halls is a wonderful thing. After that, we brought Chuck into the action with Carcassonne. For this, we used Sarah’s Carcassonne set, which is over-stuffed with a plethora of expansions: Inns & Cathedrals, Builders & Traders, Abbey & Mayor, The River II and, for the first time ever, The Tower and Cult, Siege & Creativity. The latter one was easy, being a pair of magazine promotions and some blank “design your own” tiles. The Tower, however, I was much more leery about. I have a habit of adopting received wisdom as my own opinion when lacking personal experience. In this case, I accepted that The Tower‘s central mechanic of capturing other people’s meeples is mean and counter to the traditional Carcassonne style of passive-aggressive parasitism. And frankly, they’re right. One player took advantage of the towers as they were intended. The rest of us typically used them just to get our meeples back. And none of us bothered to cap a tower. I think we just became more cagey about placing new meeples relative to existing towers. This particular session gave me a valuable experience in expansion bloat, when there are just too many rules elements flying around for the game to feel fun anymore. My ideal Carcassonne uses all the tiles, the mega-meeple, the builder, and the abbey tile because it’s useful in completing seemingly impossible to finish features. Well, I found it useful on Saturday. This was a red letter date in gaming for me: I actually declined a game of Arkham Horror — mostly because of the stuff I had lugged to Quarterstaff. Since I had lugged it, I was damn well going to play it. 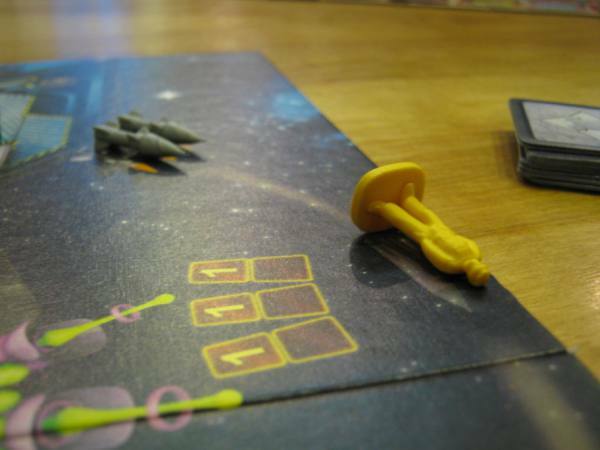 Andrew mistakenly fired the rocket tube allocated to Crewman Amber as a sleeping berth. I appear to have a comfort plateau in Space Alert. I brought the game to Quarterstaff for the second week in a row, thinking that now people knew the game, we could move on to more difficult missions. Instead, given my own lack of familiarity with the next lesson in the tutorial book, we just played through two scenarios we’d already done, both of which I think we lost for want of sufficient coordination. It was a disappointing experience for me. I feel like I haven’t learned the game well enough to lead other people through it, so playing well relies on playing with the people who more readily grasp the programming and resource management. They were off playing the new Neuroshima Hex: Babel 13, so it was the newbies and non-programmers bumbling around on board the Sitting Duck. 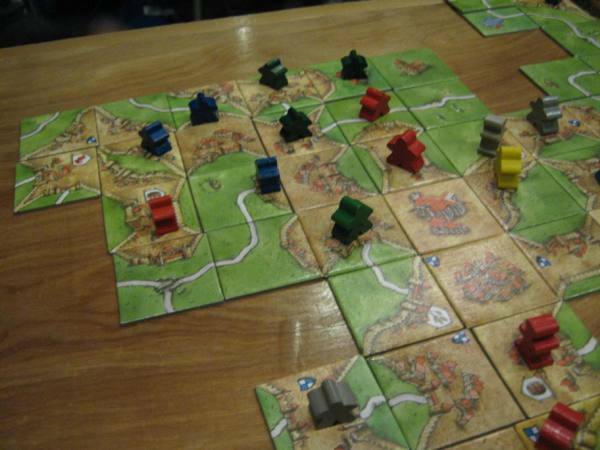 Carcassonne is a game where I wonder where if it really started out as innocently as one might think. It’s a game about placing tiles to construct pictures, essentially, with tactics, strategy, tile-counting underlying that to tickle the mechanical monkeys. It’s fun and clearly has staying power, given the variety of expansions and variations published since the first set hit in 2000. Some of those expansions make less sense than others. The Catapult, for example. For a while, I thought Carcassonne: The Castle fell towards the “gzuh?” end of the spectrum. The regular game plays just fine with two. Why would one need a variation that can only play two? Having played The Castle twice now, I can see the attraction of how the variation plays, but it’s more like a quirky, specialized implement rather than the sturdy workhorse that is Carcassonne: good once in a while in specific circumstances, but not a go-to option. Mega City Carcassonne completed, thanks to Cedric. Tonight at Quarterstaff, I got two games in. The first was intended as a “quick” game of Carcassonne while we waited for other folks to turn up. To that end, we declared there wouldn’t be any farmers. Unfortunately, that was more than counteracted by the unknown number of expansions mixed in with the store’s copy of the game. In addition to enough extra river tiles for a whole second branch, the store copy also has bits from Inns & Cathedrals, Traders & Builders and King & Scout, if not more. Thanks at least in part to players not tying up meeples in farming, it turned out to be a city-intensive game. The megalopolis you see to the right came about of at least four of the five players working to either score points, screw others over by making the thing difficult to complete or just see how big we could get the thing — which was my own goal. It was touch and go for a while as the tile bag emptied out and all the pieces we needed to finish the city were pulled by players more interested in maximizing their own scores than just fooling around. Cedric drew the final tile to complete the city and placed it, despite having only two meeples of his own in the city. Without really thinking about it, I wound up with a majority on the feature, mostly due to placing my pieces on cities that at the time seemed separate, but eventually became part of the urban sprawl. The thing was worth 130 plus points in the end, I think. It doesn’t seem fair to claim it as a personal best though, because we were mostly just fooling around. I was, anyway. By the time we finished that “short” game, another group had blown through an entire play of Ticket to Ride: Europe, which surprised me when I looked up from the table. Next to us, Brennan was drawing Sascha, John and Nonnie into a demo of Megacorps while the usual suspects clustered together for another round of Le Havre. Luke pounced on Nonnie’s vintage copy of Talisman — printed 1985, going by the copyright on the box — and I eagerly followed along. Until tonight, I had only heard other peoples’ reactions to the quest game, usually polarized into camps of “simple and boring” to “flavorful and fun.” So I was eager to have some experiences of my own to draw on in making an opinion.